I’m back from Santorini and still hosting the #iwillwearwhatilike link up – thank you to everyone who linked up while I was away! 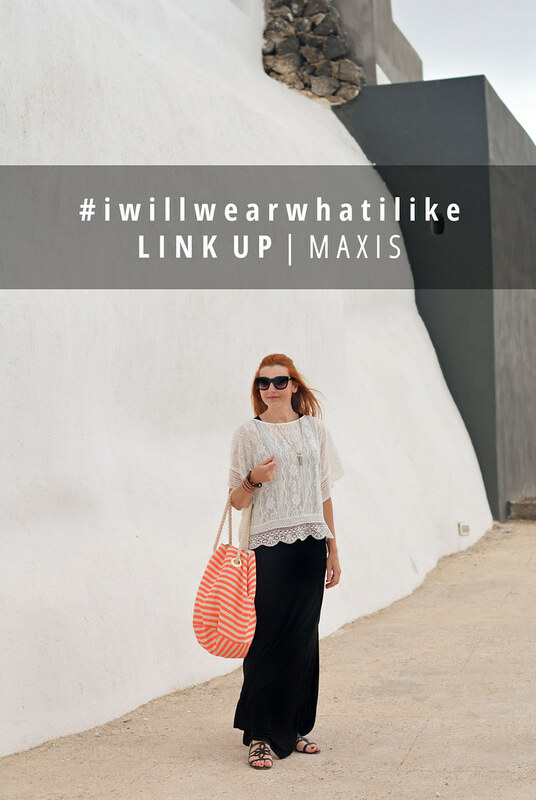 This week’s optional theme is maxi dresses or skirts, so you can link up a maxi you’ve worn in an old post, a new post or on Instagram… If not, link up anything to show that you’re part of the #iwillwearwhatilike movement! Those of you who follow me on Instagram have probably seen many of my posts from Santorini, and I also posted two mini Insta round ups while I was away to give you a sneak peek into what I was up to and what I wore on this beautiful Greek island. I have so many outfit posts to share with you that I think it may take me up till December to fit them all in: It’s strange to think I’ll be posting summer outfits right up till Christmas, so we’ll have to see! This first outfit is actually an embroidered maxi dress under the gorgeous white lace top – both of them bought for a steal in the sales before I left. All it needed was the 70s style pendant necklace plus some strappy sandals, and the striped orange beach bag gave the injection of colour the outfit (and the shoot) needed. As there were photo opportunities everywhere you looked in Santorini I tried to vary the locations somewhat, so expect blue-domed churches, the sea and sunsets in future posts. Here I matched the black and white outfit to the wall just a few yards up from our hotel, and when the sun came out we thought it was only fair to sneak in that beautiful view. Scroll down for the link up, and I’ll be looking forward to interacting with everyone much more than I was able to while I was away…! Are you a maxi skirt kinda girl? Do you like various skirt lengths or do you have a tried-and-tested one that’s your go-to style? Do share in the comments! 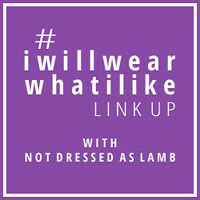 Thank you for joining my new #iwillwearwhatilike link up! This started as a campaign on Instagram in August 2015 where women over 30 wore everything on a journalist’s list of “inappropriate” items for 30+ women (including leopard print, short dresses and oversized sunglasses. Yes, really). It was so popular that I decided to carry it on weekly where women of all ages link up their fabulous style, never mind what anyone tells them not to wear! 5. Visit some of the other links and share the love! Catherine, I just wanted to let you know that your #iwillwearwhatilike movement was one inspiration for my most recent blog post. So thank you! Oh yes, ever so nice. Feminine and modern. Black and white and still colourful. I love it that you are so skilled you can take pictures in the sunshine. I haven't mastered that yet. Gorgeous, Catherine! 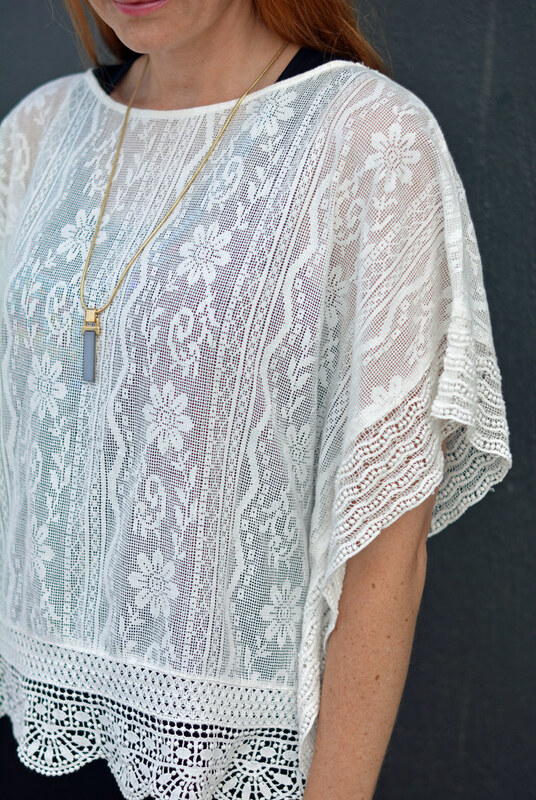 The white lace top is perfect with your maxi dress! And the scenery is exquisite! Santorini looks gorgeous,and so do you! I love the lace top layered over the black dress. I'm in the midst of digging out holiday clothes ready for a week in the sun soon…that week of sunshine will have to see me through the winter months until Spring so I'm determined to make the most of it! Such a beautiful outfit. Loving the sheer lace top more. Welcome home dear Catherine. I am so looking forward to each and every post from Santorini. I bet it was just dreamy! Catherine, I made it to this link up earlier this time! I was up in the middle of the night. I hide my phone in the drawer, but since I was wide awake, I opened and saw your tweet. I linked up for posts this time. I don't wear maxis much (as you know I like to usually show my legs! ), so I re linked the Fab Fringe. I hope that's ok. I also linked up my DIY tee shirt hack. I also hope that's ok. Thank you for joining my attempt to start a link up too Catherine. It really means a lot to me as do the tweets you made. You continue to amaze me, AND more importantly, serve as my role model. Love it! The blouse looks great with the maxi dress, and the bag adds just the perfect little pop of color and fun! Andrea thank you so much! You never know, we may just be planning to go back next year (I'm not kidding)…!! Love your white lace with black maxi! Stunning, as always! I really enjoyed your beautiful pictures from Santorini. I'm sad it's over, as I'm sure you are too! I love your outfit, the top is exquisite. Gloroius detailing my friend on this romantic lace top!! I love it with the maxi and what better surroundings!! Sounds like you had a wonderful time in Santorini, and this looks so lovely!! Just you wait, Jess – the locations are going to get even better!! Thanks my lovely, I'll be sorry to put the top away for winter…! Beautiful Catherine. I love how the pattern of the sandals, fit so well the delicate pattern of the top. And then the orange striped bag for just a pop of colour! I've loved maxi dresses for ages and my collection is growing year on year but for the first time this year, I managed to find a maxi skirt which are rare to find if you're a petite. I love it as I'll be able to wear it even in winter with a chunky knit and biker boots. Glad you had such a good holiday. You married and wise and wonderful man, then! Haha yes – he's known me long enough to give me an instant decision when I can't decide whether to keep something I've ordered or if I'm trying to choose which shoes to wear with my outfit. He knows it'll get us out of the house quicker if he's honest – it helps my indecisiveness!! Beautiful photos Catherine! I've enjoyed following your beautiful vacation via IG. Alice thank you so much!! I could have posted soooooo many more on IG, had to reign it in a little…! ah I hardly own any long dresses, so it's a mini dress from me! Your look is fantastic and definitely "Santorini" appropriate! From what I gather from Instagram you definitely enjoyed your time in the island! Well, even though I just bought a new maxi dress, I haven't worn it yet, so I am going to link up a super old post that is also one of my most popular posts ever. Love your outfit! That top is gorgeous! Aww I'm sorry the timing was just out for you, Amy! Thanks my lovely, so glad you love the top (I do too)!